This painting was selected by the painter to be among the six works he presented in April 1877 during the third Impressionist exhibition. Caillebotte, a young annuitant barely thirty years old and impassive observer of the intimacy of the family circle, realizes here a collective portrait of his relatives grouped in the garden of the property acquired by his father in Yerres. On this oil on canvas dated 1876, we can recognize, absorbed by their needlework, in the foreground on the left the cousin of the artist, Marie. 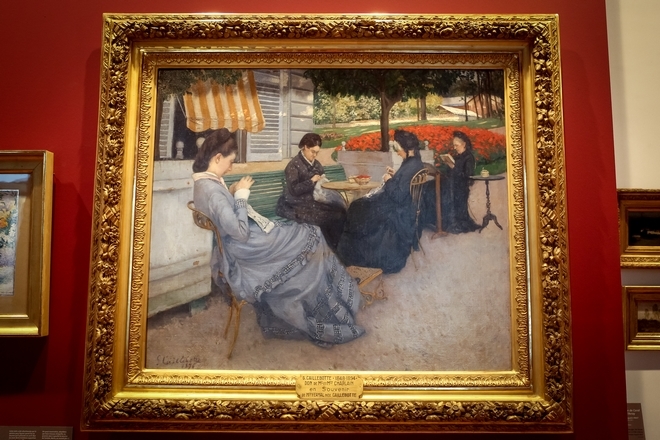 In the background on the right seats the mother of the young woman, Mrs. Charles Caillebotte, in front of her Mrs. Hue, a friend of the family and finally deep down, immersed in reading, the painter’s mother. The donation of this work to the museum is associated with the memory of another cousin of the artist, Zoe, absent from the composition. This work is indeed a gift given by Caillebotte on the occasion of the wedding of this young woman in Bayeux June 17, 1887. The painter participated to the celebration as the bride’s witness.